The dough divider MARK is an automatic volumetric divider, designed for dividing (almost) all typesof dough. The possibility of changing the dividing from 1- to 2- or 3- or 4- pockets assures a wide dividingrange and high capacity. Two models are available: MARK and MARK ATT. Both models are equiped withan electronic control panel (PLC) for automatic operation.The MARK ATT version is completed with an automatic weight-checking unit, which corrects the weighingaccuracy in case of weighing deviations over the operator’s selected weight limits. The possibility of producing different products in thesame line, which is enabled by the design of the suction mechanism. Large weight and capacity range. The hydraulic regulation of the pressure in the dividing pockets assures the possibility of dividing even the softes types of dough with a minimim impact of its porosity. The integrated software proposes the user the correct combination of pistons and the number and size of the dividing pockets with regard to the selected weight and capacity. 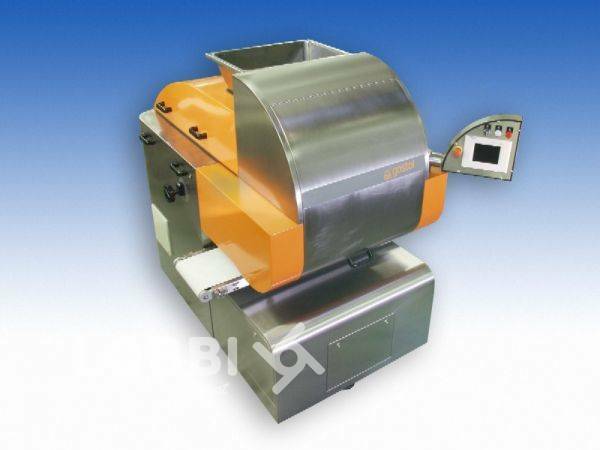 The divided dough pieces can leave the machine in one or two directions, and thus the machine can supply two moulding lines. It can be employed in complete automatic make-upplants or integrated into existing lines. All parts in contact with dough are made of alimentary irreproachable materials (piston from bronze, dividing and suction mechanism from Ni-resist). The electronic control panel (PLC) assures completely automatic operation.